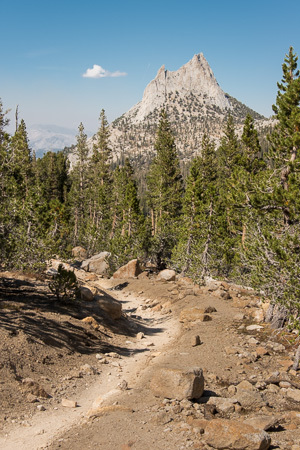 The JMT as it leads you to Cathedral Peak. You should see this sometime during the first three days. What a great time of year it is for John Muir Trail hikers. Except for those early-season, mosquito-loving, hip-deep-stream-crossing, extreme-adventurers, who are spending all their time at the FAX machine trying to get that perfect wilderness permit, now is a period of contemplation, not action. There are still a couple of months before the training starts in serious, and you haven’t yet replaced the sirloin and seafood with ramen and macaroni & cheese so you can afford that special shelter. You know, the one that is so light it’s delivered in an envelope with a first class stamp. Here’s what you can do, now, even if the snow is up to your ears outside: learn something. The five websites, below, are a great way to do just that. 5. The Backpacking Chef. I don’t know about you, but I feel myself entering a new phase of my backpacking career. This phase is going to be more about enjoying the moment than achieving certain milestones. One way to do that is to eat better on the trail. By the looks of his website, Chef Glenn McAllister knows how to do just that. This is a comprehensive site. There are sections with recipes for breakfast, lunch, supper, snacks, and desserts. The pages on dehydrating food are a gem (and a great way to save enough money in order to buy that Cuben fiber tarp). There are even sections on stoves and cookware. Spend some time in this site, do some experimenting at home, and meals on the trail might be much more than just refueling. 4. All Trails. Eventually, the snow is going to melt and you’re going to need to get out there and do some training hikes. You already know the ones closest to your home, and, of course, your ultimate goal is to be stepping off from Happy Isles (or a suitable substitute) heading in the direction of Mount Whitney. But what about some fairly close, and a bit more challenging, opportunities? Perhaps a three- or four-day jaunt that will give you the chance to shakedown some new gear or techniques. With a slick interface and the backing of National Geographic, alltrails.com is quite a resource. A couple of additional reasons to click through: right now they are having a sale on their “pro” service. Instead of $50 a year it’s only $20. Also, they have a pretty decent iPhone app. 3. Backpack Gear Test. Far be it for me to imply that the reviews you read in the glossy outdoor magazines might be less than completely candid, especially when assessing their advertiser’s current offering, but why not get another opinion? All the reviews I’ve read on this site lack the hip allusions to the latest in pop culture, but they have been great in telling me what I actually want to know about the product. If that isn’t enough, how about this: you can actually email the reviewers and ask them questions! 2. Backpacking Light. Brace yourself…this is going to sting a bit: not everything on the internet is free. Really. Backpackinglight.com will cost you $25 a year, and it’s a bargain. You’ll find terrific trip reports, good gear reviews, and a fairly extensive used gear sales forum. There is a regular forum monitored by some incredibly experienced backpackers, eager to answer your questions. Looking for a way to pay the $25 subscription fee but save money overall? Check out their make-your-own-gear section. 1. Yahoo John Muir Trail Group. I’ve saved the best for last. While this is more a “forum” and less a “website”, it is still an incredible resource. You can post questions, get answers, and mine the extensive digital files that are on the site. You have to ask permission to join, but as long as you don’t claim to be a foreign prince looking to smuggle cash into the country (“all I need is your bank account number”) gaining admittance is pretty much a rubber stamp. Once a member, you’ll find an online community that is respectful and knowledgeable. It’s also gently—but effectively—moderated. During the hiking season it’s a great place to get the latest information regarding trail conditions. There you go: five websites to wander through while you are trapped inside for the winter.